Fiction – paperback; Scribner; 283 pages; 2006. Review copy courtesy of the publisher. 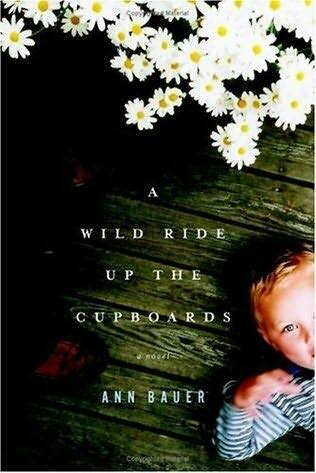 A Wild Ride up the Cupboards by Ann Bauer is an emotionally charged story about a young mother’s struggle to keep her marriage alive and her family together when her eldest son, four-year-old Edward, withdraws from the world. Rachel, heavily pregnant with her third child, is deeply upset about Edward’s inexplicable illness, in which he loses the ability to speak, goes through periods of hyperactivity and suffers from severe insomnia. Together with her husband, Jack, an itinerant worker whom she met in college, Rachel does everything in her power to find a cure for their young son, even resorting to the highly controversial practice of feeding him marijuana tea. Later they try an unusual physical therapy, which they believe reaps results. Meanwhile, Rachel, delves into her family history, looking for any genetic clues that might help solve the riddle of Edward’s undiagnosed illness, thought to be a form of autism. But through the years, the stresses of Edward’s problems, has drastic repercussions on the rest of the family. This wise, intelligent debut novel reminds me of the best of Sue Miller’s writing with a little bit of Anne Tyler thrown in. It very deftly captures the anguish of a mother’s love for her child and her desire to do anything to protect her young son from pain and suffering. It also expertly charts the inner life of a family under financial and emotional strain, and throws open the doors on the inner workings of a marriage that been on the defensive from the word go. But this is not a perfect novel. The back story about Rachel’s late Uncle Mickey, which is told in alternate chapters, did not really work for me. Perhaps because these chapters were so well written I could feel myself becoming so immersed in Mickey’s story that the jolt back to Rachel’s narrative was sometimes too jarring. I don’t think Mickey’s life really offered up many clues to Edward’s illness, so didn’t quite see the point of devoting so many pages to it. I also felt that towards the end, the overall story was weakened by a slow descent into a social services-type scenario which bordered on melodrama. I felt myself having to suspend belief in places. This ruined what had been — up until that point — a very realistic and painful portrayal of a family under siege from within. Despite these little quibbles, overall this is a beautifully drawn story featuring a strong narrative voice that brims with an undercurrent of slow-burning anger reminiscent of Goldberry Long’s Juniper Tree Burning. The characters, while not always likable, are wholly human, complete with flaws and foibles, and for that reason the book rings completely true. If you like well written family dramas that show ordinary people dealing with extraordinary circumstances, then you will probably find it very difficult — just as I did — to put down A Wild Ride Up the Cupboards.